We’ve been covering the modern custom scene for eight years now, extending feelers into nearly every country in the world, from Andorra to Vietnam. But there are a few builders who have inexplicably slipped through the net—and one of the most renowned must be Craig Rodsmith. 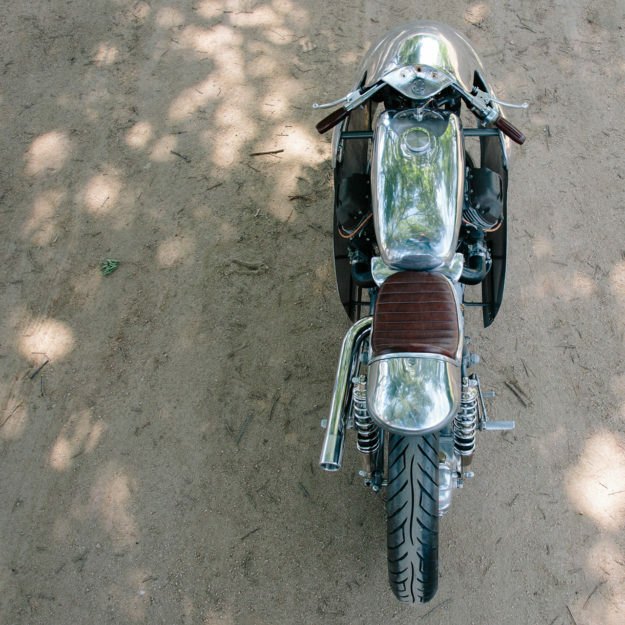 An Australian based in Illinois, USA, Craig has been building bikes since the late 1970s. 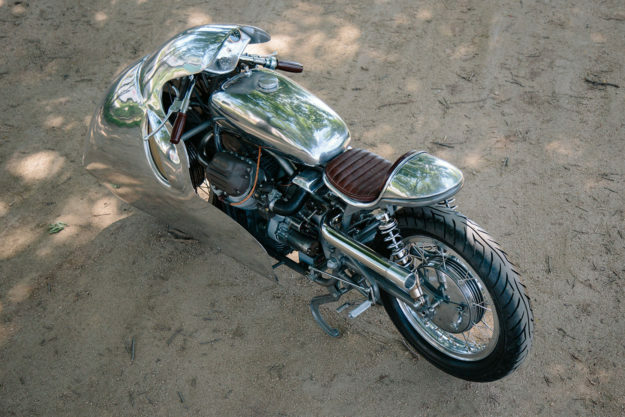 And when it comes to shaping metalwork, his experience shows. 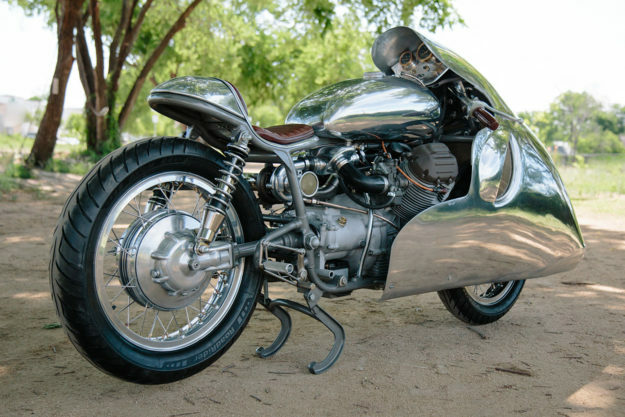 The hand-formed aluminum on this turbocharged Moto Guzzi ‘dustbin racer’ is so exquisite, the bike was sold as soon as it went public at the Handbuilt show. 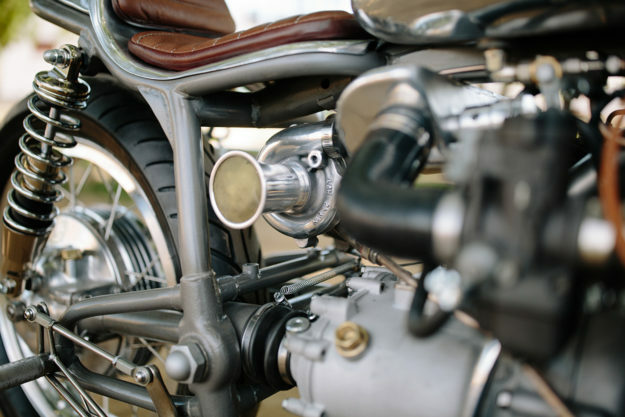 The looks are pedigree, but this Guzzi is really a ‘bitsa’ based on a 1969 Ambassador loop frame that Craig has heavily modified. He’s cut it down by 3½ inches, and the rear section has been completely reshaped with an elegant little upkick. Joe’s balanced the engine for smoothness and longevity, and it’s also been converted to a front alternator, to make room on top for the custom exhaust. There’s no word on power output, but you can bet it’s ample. 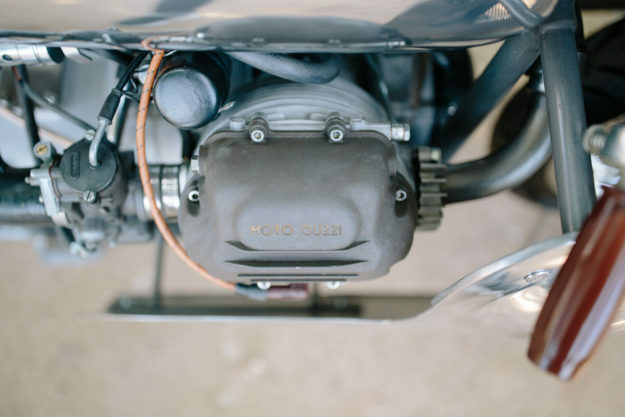 It feeds through a 4-speed box, hooked up to a lightened flywheel for snappier throttle response. 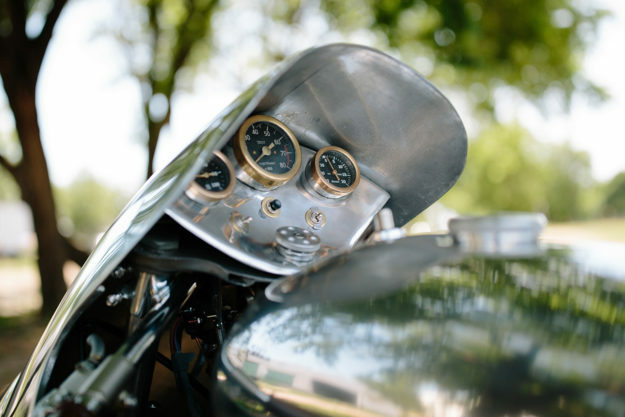 There’s a small low-pressure fuel pump under the tank, which is regulated to maintain about one pound over boost pressure. And the whole installation is so discreet, with a passing glance you could easily miss it. The vintage vibe continues with the late 60s forks, and if you take off the dustbin-style fairing, you’ll see a twin leading shoe hub. It’s a stylish match for the 18” Borrani wheels, which are refurbished originals and shod with Avon AM 26 Roadrider tires. A custom set of Super Shox suspends the rear. 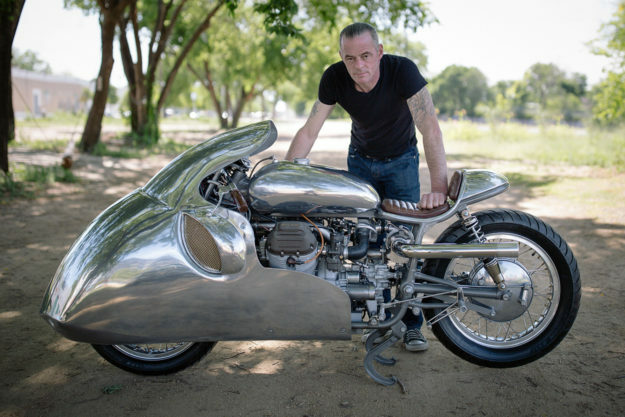 Craig is famous for his metal shaping skills, and it’s easy to see why: There’s no CNC work or laser-cutting going on here. 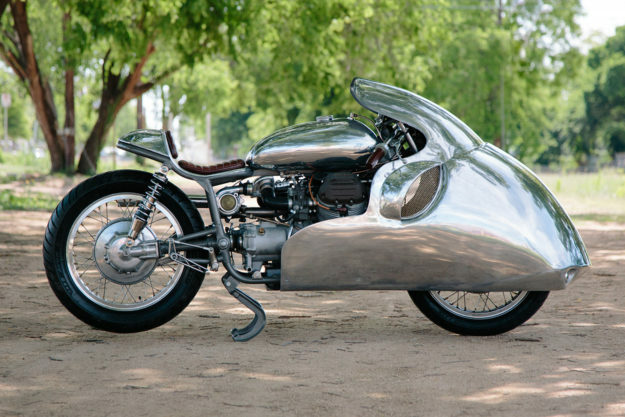 “I’ve wanted to build my take on a dustbin racer for over twenty years,” he says, “and it had to be in my usual style—hand made and bare metal. 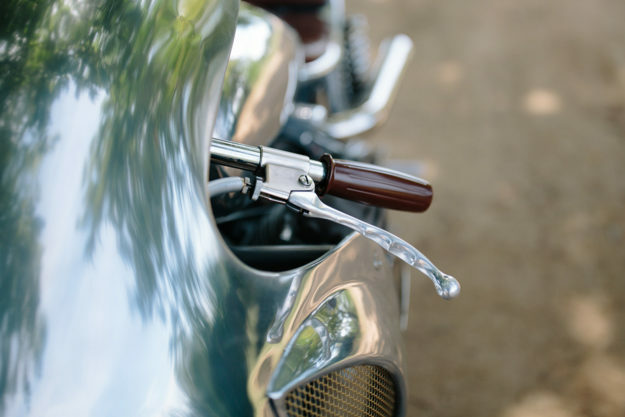 The little details are just as impressive as the big picture—from the stainless trellised rear sets to the handmade gauges, which hide modified Veglia internals. Craig only stopped working on the Guzzi the day before the Handbuilt show. 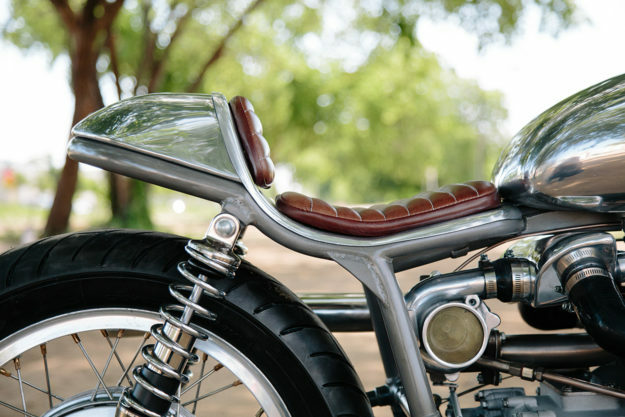 “I got it dialed in almost perfectly, but was unable to ride it much.” At the show the renowned collector Bobby Haas spotted it, and snapped it up immediately for his incredible Haas Motorcycle Gallery in Dallas—which holds almost 40 vintage and custom motorcycles dating back to 1901. That’s probably a good move. 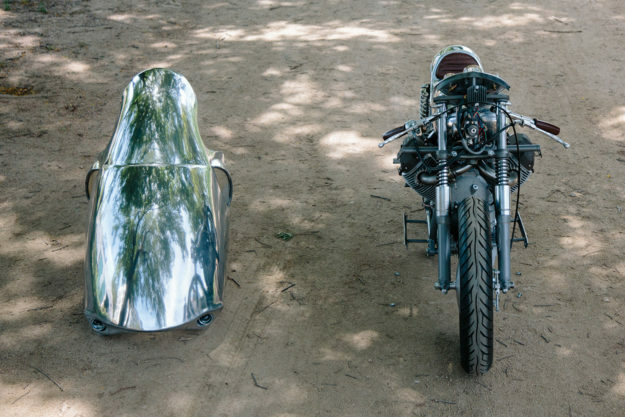 The thought of dropping a bike with handmade bodywork this beautiful is frankly terrifying—and there aren’t many people left with the traditional skills to recreate it.